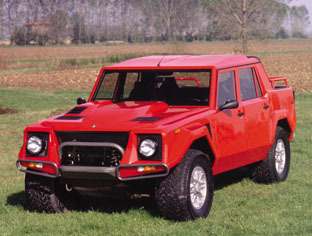 Back when the Lamborghini LM002 was introduced in the mid-eighties there was no real competition. 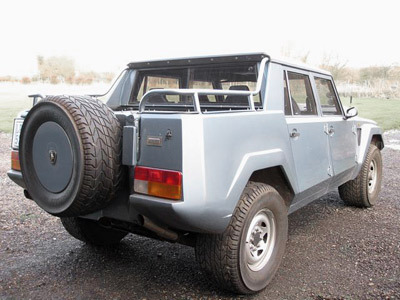 Sure there were Range Rovers and similarly luxurious 4x4's but there were none which were quite as ostentatious, expensive and unusual as the LM002. Nowadays a large proportion of luxury car manufacturers produce 4x4 models including Porsche, BMW, Audi and Cadillac, and soon Spyker will have their own 4x4. 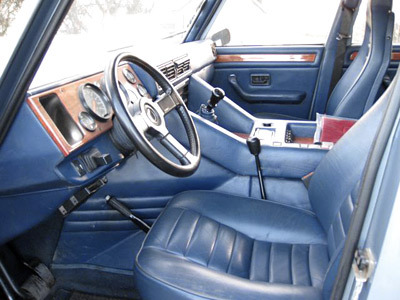 When the LM002 was conceived it was initially designed to suit military applications. Lamborghini developed the LM002 under contract from an American company called Mobility Technology International (MTI). It was hoped that the model could be sold in bulk to various armies as a way of quickly increasing Lamborghini's bank balance, while at the same time offering Lamborghini a chance to further develop its road cars. 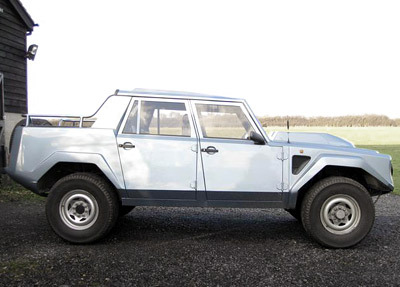 The Lamborghini LM002 was first shown in concept form way back in 1977, at the Geneva Motor Show. At its unveiling it was called the Cheetah. It was a doorless, four seat vehicle which was powered by a 5.9 litre Chrysler V8 which produced 183 hp. Unfortunately for Lamborghini the Cheetah's design was obviously lifted from Ford's XR-311 due to some rather underhanded corporate espionage from MTI. Ford were so incensed by the Cheetah's copycat design they even threatened to sue Lamborghini if they took the program any further - so they didn't, which didn't matter much anyway because the US military went with GM's Humvee anyway. In 1978 Lamborghini went into receivership, largely due to the Cheetah and MTI debacle. For several years Lamborghini battled on under the receivers, then in 1981 the company was bought by Patrick and Jean-Claude Mimran. After buying Lamborghini the brothers found out how much the company had poured into the development of the Lamborghini off-road project, and decided the company should continue, albeit with a bit of a redesign. 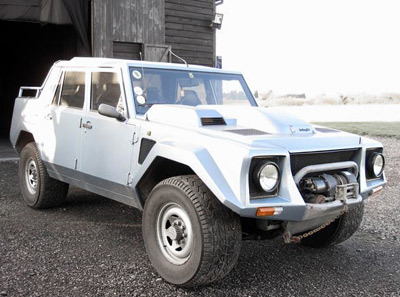 The first prototype was called the LM001, the name stood for Lamborghini Militaria No.1. This vehicle was powered by a mid-rear mounted AMC engine which spewed out 180 horsepower. The next major development came just a year later when Lamborghini revealed the LMA002. The 'A' stood for 'anterior', which translates to 'front' to describe the engines new mounting location. With the LMA002 Lamborghini also gave up on the idea of producing a vehicle to suit the US Army, this meant they could now use an Italian drivetrain. You can almost imagine it... Luigi what's this? A 4.8 litre V12 from the Countach you say, with 332 horsepower? Yes that'll work. After the LMA002 came a couple other prototypes but the definitive model was the LM002. This came fitted with a 5.2 litre Quattrovale V12 which churned out a mighty 450 horsepower. Despite its massive bulk the LM002 could reach 60 mph in just 7.7 seconds, on its way to a 130 mph top speed. Despite all the effort, and the better part of a decade that had gone into developing the Lamborghini LM002 as a military vehicle, it was only bought by a handful of countries - mainly Saudi Arabia and Libya. Most LM002's were bought by obscenely rich private buyers. During the few years it was on sale it's price tag was nearly three times that of a fully equipped Range Rover, and it matched the Countach for price. In total only 301 LM002's were made by the time production ceased in 1990.